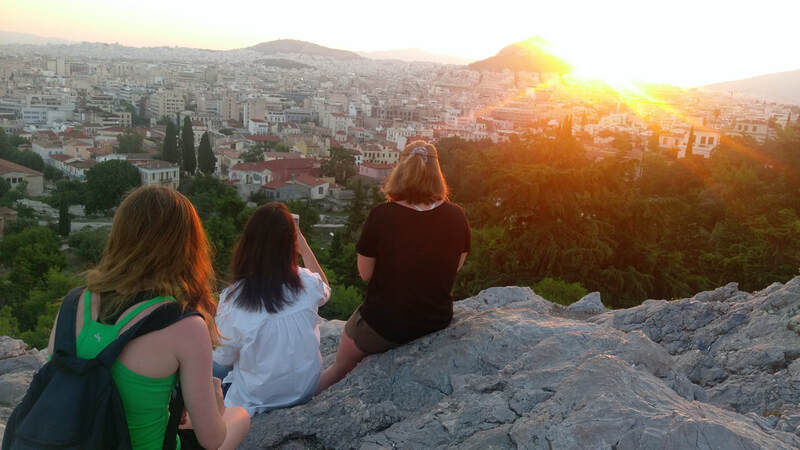 We all arrived safe and sound and have spent the past week in Athens. Wednesday featured a visit to the Athenian Agora. The visit provided an excellent opportunity for students to use their imaginations to transform the ruins into a once thriving urban space. The Agora also includes the relatively intact Temple of Hephaistos. Thursday was packed with activities. After the Agora and its museum, we travelled to the National Archaeological Museum, whose encyclopedic collection tells the story of Greek art and culture. Friday featured what students considered an excellent balance between business and pleasure. The day began with a trip to Mycenae, which entailed more climbing to reach the settlement. The ascent was hot and sweaty, but well worth it considering we were standing in an area with the remains of structures some 3,000 years old. And that brings us to the beach. Given how much we had covered in previous days, it was a welcome respite. ​We are closing in on the end of our trip. We were sorry to leave Florence. In an unscientific poll, respondents said that its relatively small size, abundance of sights and things to climb, and most of all, its food made it their favorite city. One of the attached pictures shows the winners of the the Florence scavenger hunt in their aprons, prizes selected by Justyna. 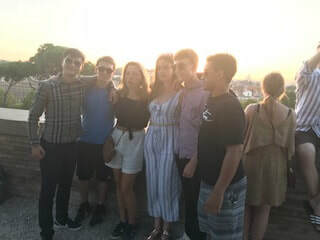 That said, we've had a productive time in Paris, which began with a visit to Montmartre, where students were able to experience the kind of neighborhood feel typical of many parts of the city before the major renovations of the 19th century. Other highlights of the week have included trips to the Louvre, where everyone had a chance to see how small the Mona Lisa is, and the Musee d'Orsay, where a museum tour guide gave us her version of the history of late nineteenth-century art. 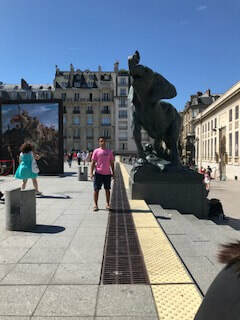 Adam graciously posed by Fremiat's elephant, our meeting spot at the Orsay. Wednesday had us all at Versailles with its insights into how those with claims to absolute power lived. The complex easily puts paid on Louis's claim, "l'etat, c'est moi." The size and opulence of the palace combined with the dense crowds made the visit feel overwhelming for some. However, thanks to Louis XIV, we were able to escape to the gardens where students boated on the Grand Canal, braved the Labyrinth, strolled the parterres and bosquets, and escaped like Marie Antoinette to her Hameau, or Hamlet, where she traded her life as a queen for that of a dairymaid. Moving along, we'll be cruising along the Seine this evening before our final group dinner. Do you want here about the experience from the student's point of view? Click here to read our student blogs. city but the pizza we enjoyed made the hair raising walk well worth it. Move over Papa Gino’s and Pizza Hut because the Neapolitans have raised the dish to an art form. A dip in the pool at the Grand Hotel Vesuvio and dinner in downtown Sorrento ended the day. The view of Mount Vesuvius was not half bad. to rest in the Piazza del Campo . They soon revived. chefs did a superb job feeding us. 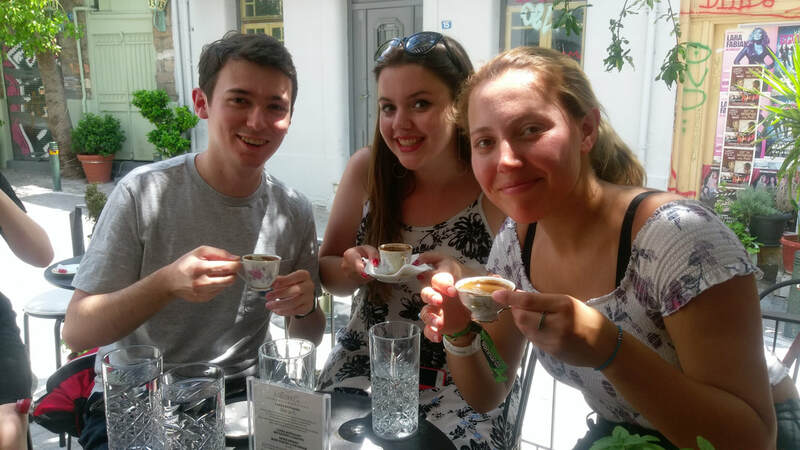 ​Here is a student blog on 2018 Western Civilization Program. ​In Rome, we’ve been able to consider three different periods in history: ancient Imperial Rome, Renaissance Rome, and Counter Reformation Rome. Bernini’s art and architecture, seems to have captured students’ imaginations as has Caravaggio’s more vernacular approach to image making. Both Bernini and Caravaggio were on display at the Borghese Gallery, our visit to which was followed by a picnic in the adjacent gardens. Students were able to rent bicycles to tour the park. Many wanted to try out the five seater vehicles. However, the designated driver of these contraptions had to be 18-years-old and licensed, which meant the honor of piloting the vehicle fell to me. Previously during our week in Rome, we went back to where it all began when we visited the Forum and the Colosseum, giving students the opportunity to play archaeological detectives trying to figure out what was what and what the original structures looked like. We also took in the Pantheon where once again the marvels of Roman engineering were on display in the curved floor designed to drain the rain water that came in through the oculus and the unreinforced concrete dome, which remains the largest in the world. During all our visits to the ancient world, here and in Greece, students have become aware of how much the national identity of the US owes to the art and culture of ancient Greece and Rome. One of our favorite visits was to the Capitoline Museum, where students indulged me by posing near a rather large marble foot, one of the remaining fragments of the colossal statue of the Emperor Constantine, which stood some 40 feet high. 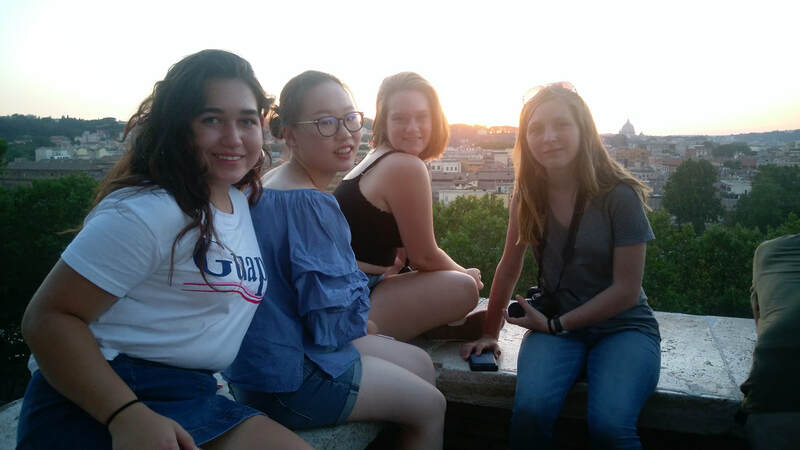 So far, the students have enjoyed a good balance between “fun” and learning and seem genuinely appreciative of the opportunity they’ve been given. Today’s learning took place in the National Archaeological Museum in Naples and the “fun” portion of our program occurred in the swimming pool at the Hotel Vesuvio in Sorrento. After all the climbing and walking we’ve done, the pool was a welcome respite and gave everyone the chance to relax and digest all that we’ve seen. We spent an idyllic last evening in Rome, where we enjoyed a picnic in the Giardino degli Aranci. The park is near one of few extant early Christian churches in the city, Santa Sabina, and features orange trees reportedly brought by Saint Dominic from Spain. The site affords a spectacular view of the city, which we saw at sunset. A few students observed an early evening marriage proposal, which according to their photographic record was successful. Our evening capped a busy day which began at the Vatican Museums and concluded with a visit to St. Peter’s. Even though students are used to large American buildings, most said they had never experienced anything like St. Peter’s before. And yes, we also managed to squeeze in the Sistine Chapel! Hi, My name is Karyn Esielonis and I, along with Justyna Ptak, will be guiding the students on their tour of European cities central to the foundations of Western Civilization. As I've told you in previous communiques, I have been teaching college level art history for some time now. Schools where I have taught include Tufts, Brown, Wellesley, and BU. I received my BA and PhD from Harvard. I'm excited to be leading the students and to be out of the classroom and into the field so-to-speak.